The CR3 establishes a new benchmark for Portable Data Terminals (PDT) and Hand Held Computers by combining the industry ’s best imaging technology with a graphic display and rugged keyboard to create the smallest and lightest full-featured barcode reading terminal on the market. Scans Datamatrix ,QR Code, PDF-417, Aztec Code, RSS Composite and many more 2 Dimensional Barcode Symbologies as well as all linear barcodes. 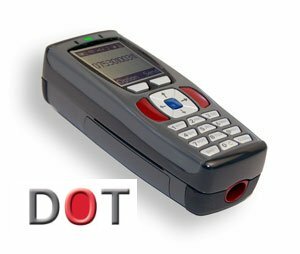 Using the same ergonomic platform as the highly successful CR 2.0 2D Barcode Scanner,the CR3 extends mobile all-symbology bar code reading to include information display and keyboard entry. The CR3 instantly reads large linear as well as high density matrix symbols due to the unique Dynamic Optimization Technology (DOT), which continuously adapts the resolution,illumination,and image field for the fastest automatic symbology identification and decoding over the widest range of symbology types,sizes,recording surfaces and ambient lighting.With DOT,the CR3 achieves matrix symbol decoding at speeds that are similar to linear barcode decoding,while preserving battery energy.By monitoring each user ’s reading patterns,DOT reduces training time and eliminates the need for manual configuration optimization through parameter settings. The CR3 features a 1.3 MegaPixel dual-field image collection engine,a 400MHz AMD Alchemy au1100 CPU,and 4MB of non-volatile memory.Portable operations are supported by a 1950 mAH Lithium Ion Battery and a Real Time Clock with its own battery backup system. 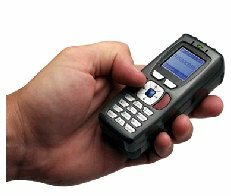 For wireless communications,a 2.4 GHz radio system is available and compatible with a wide range of Bluetooth systems as well as the CodeXML Modem, with a unique data and pairing encryption system for unsur- passed wireless data security. Memory 4MB of memory for data and user programs.